Win Molly's Game: Take a gamble on this thrillingly true story | SWITCH. 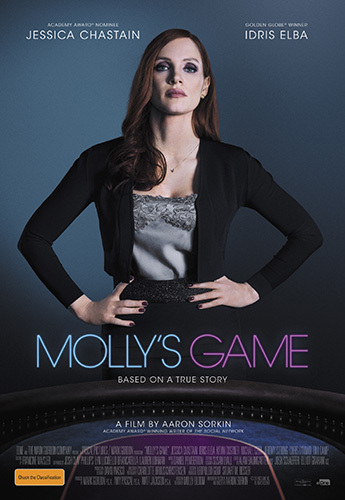 Starring Jessica Chastain and Idris Elba, 'Molly’s Game' tells the thrilling true story of Molly Bloom, the mastermind behind a poker empire whose players included the rich, famous and most powerful men in America. In a career-best performance, Chastain portrays Molly as she rises from Olympic-hopeful athlete to running the world’s most exclusive poker games in LA and New York. The deep pockets of Hollywood royalty, sports stars and business titans give her a decade of glitzy, glamorous success. But it all comes crashing down when the FBI come after her, suspecting ties to the Russian mob. Academy Award winning writer Aaron Sorkin ('The Social Network') delivers a quick-witted, fiery directorial debut with Molly’s Game, taking us behind the headlines of Hollywood’s “poker princess” to reveal a smart, talented young woman who gambled everything, won big, then lost it all. The 'Molly's Game' competition has now closed. Winners will be announced shortly. Competition opens at 5pm AEDT on Sunday 21st January 2018 and closes at 11:59pm AEDT on Sunday 28th January 2018. Ten winners will be chosen at random on Monday 29th January 2018. To successfully win, entrants must fulfil the above entry conditions before the time the competition closes. Current members/followers are eligible to enter the competition. Only one entry per person. Only one winner per household. To be a valid winner, the entrant must not have won a prize from SWITCH within the last 28 days. Each winner will receive one double pass to 'Molly's Game'. By entering, you agree to receive occasional emails from SWITCH in the future. If you decide to unsubscribe from these updates, any further entries will not be applicable. Only Australian residents are eligible to enter. 'Molly's Game' is in cinemas from Thursday the 1st February 2018 through eOne.